Strongly recommended for investment in early 2011 (Q I). High risk, high reward. It seems like that INCY may release Phase III trial data (COMFORT-1, INCB18424 for myelofibrosis) in December 2010. If trial data are good it will be strong evidence that JAK inhibitors are really effective against cancers. However, trial failure will hit INCY badly i.e. 30-40% losses are possible. Disclosure: I bought 3k INCY today and will keep it through trial results release. I think that it's very high risk investment, because INCY drug is experimental drug with unpredictable efficacy and side effects. However, drug success will open a new direction in cancer treatment. After very good trial results release INCY pps is in unstable equilibrium. Just for case ("sell on news effect") I activated trigger to sell INCY at market if pps goes below $16.90. Most important that trial gave the evidence of strong science basis of INCY. 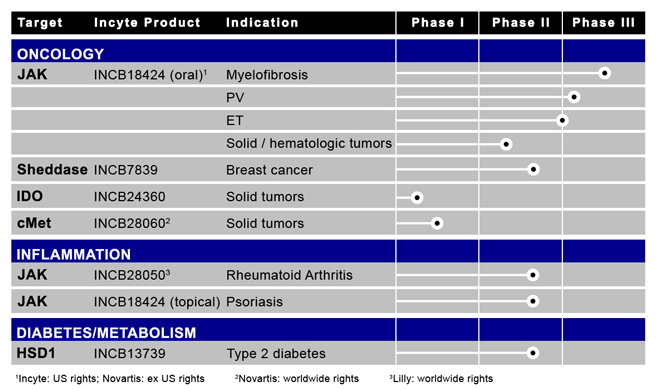 Thus, INCY become possible acquisition target for big pharmas like Novartis or Lilly.